Advanced Forward Lighting Systems (AFS), meaning headlight systems that for example adapt their illumination direction to the direction of the bend when driving through curves, can now be even more simply realized by automotive producers. 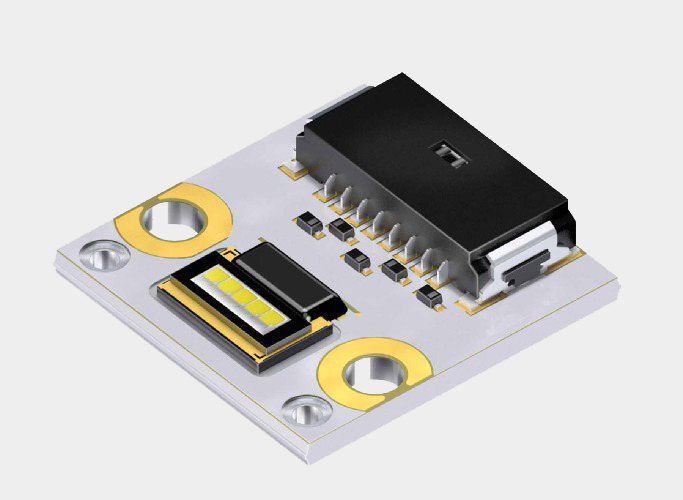 The high-tech company Osram Opto Semiconductors from Regensburg, Germany developed with the new Osram Ostar Headlamp Pro for the first time a specific LED component for this particular implementation. The five chips of the new multi-chip LED can be individually controlled and thus flexibly switched on and off according to the driving situations and positions of other road users. The new variant of the Osram Ostar Headlamp Pro LED is the first multi-chip LED specifically developed for Advanced Forward Lighting Systems. Thanks to LED technology, Advanced Forward Lighting Systems (AFS) can be implemented more simply than before because no mechanical assemblies are required to move parts of the headlight or the complete headlight. With LEDs such as the new Osram Ostar Headlamp Pro, the individual chips are specifically switched on and off via intelligent control. The control utilizes sensors and electronic components for high beam light without glare by flexibly concealing areas within the light cone of the headlight according to the specific driving situation and with dynamic adaptation to the positions of other road users. It is also thanks to LED that adaptable cornering light and spot light can be easily implemented for illuminating possible obstacles at the edge of the carriageway. Multi-chip LEDs with higher performance classes are needed for use in headlights, and the Osram Ostar Headlamp LED range features high performance-capable technology, homogeneous luminance and temperature stability, and is therefore especially suitable for high power applications. This is the reason why LEDs of this family have been used since 2008 for various automotive led lights functions. “Osram Ostar Headlamp Pro is now the first LED specifically developed for use in AFS. Its five chips each with one square millimeter can be controlled individually, forming the basis for intelligent light solutions,” explained Peter Knittl, responsible for LED Automotive Marketing at Osram Opto Semiconductors. “Intelligent headlight systems with our light emitting diodes give car drivers optimal vision even on the edges of roads or with approaching vehicles, offering better protection from possible accidents. Thanks to the five individually controllable chips, more than one road user can be concealed from view and the intermediate area is still completely illuminated,” said Knittl. A distinct bright-dark contrast of 1:65 between illuminated and non-illuminated chips is required so that the AFS is as effective as possible and the light beam on the road is optimally transmitted. This means that concealed chips must be genuinely dark and must not be illuminated by their adjacent chips. An integrated shutter also enables a clearly defined light beam from the headlight.